Catherine brings an expressive warmth to her singing, as well as a skilled ability to communicate the emotional content of a lyric. Her unique abilities as a performer are a culmination of her natural talent, as well as her experience and training as an actress and vocalist. While at Indiana University's School of Music (from which she holds a B.S. in both Music and Theatre), she studied with the legendary Eileen Farrell, known not only for her work as one of the great contemporary operatic mezzo-sopranos, but also as one of the foremost interpreters of The Great American Song Book. While at Indiana University, Catherine performed with the highly regarded Singing Hoosiers under the direction of respected music educator Robert Stoll. Catherine worked her way through an M.F.A. in Acting and Movement from Penn State University by doing local voice-overs, jingles and backup recording work in central Pennsylvania studios. In 1985, she moved to New York City. Since 1994, Catherine has appeared to critical acclaim at popular New York City venues, including Iridium, Smoke, the Knickerbocker, Enzo's Jazz (at the Jolly Madison Hotel), The Metropolitan Room, Chez Suzette, Shelly's NY, Metronome, Cleopatra's Needle, The Encore, "Live at Opia," Jilly's NY, La Belle Epoque, Don't Tell Mama, The Triad (formerly Steve McGraw's), Danny's Skylight Room, Eighty-Eight's, the Caviarteria at the Soho Grand and Town Hall for the Mabel Mercer Foundation's Cabaret Convention. She has appeared at the Mohonk Mountain House Jazz on the Mountain (hosted by Michael Bourne of WBGO-Newark, NJ), the Sackets Harbor Jazz Festival, the Montclair (NJ) Women in Jazz Festival, and The Central Penna. Festival of the Arts. From Cole Porter to Sting, Catherine's eclectic taste in musical material often finds her performing a broad spectrum of music. Her repertoire includes jazz standards and American Popular Songs, as well as fresh, contemporary compositions (by David Cantor (Dave's True Story), Deirdre Broderick, Bill Mays, Mark Murphy and Russ Kassoff). Catherine sings regularly with the Russ Kassoff Big Band, an ensemble that features the best musicians from the Broadway pits and on the New York jazz scene. Catherine's latest CD, Rules of the Road (released May '05), was conducted and arranged by Mr. Kassoff, and Bucky Pizzarelli, Ted Nash, Martin Wind, Marvin Stamm among others. Scott Yanow (All Music Guide) writes: "One of the most interesting jazz singers of the early 21st century." About Moments (released May '01), Zan Stewart (DownBeat/Newark Star Ledger) said "Gifted with a stunning alto voice, a stellar sense of time and deep intuition about how to render a lyric, a rising star to keep your eye on." About her debut CD, I Hear Music (released May '99), Jerome Wilson (Cadence) said "Her hard swinging style continually reminded me of Annie Ross. If Janis Siegel or Cheryl Bentine ever left the Manhattan Transfer, she'd make a perfect replacement." Rules of the Road, Moments and I Hear Music are all available on line at: www.catherinedupuis.com, www.cdbaby.com; at Tower Records and Virgin; distributed by NorthCountry. Catherine has performed regionally and off-Broadway for over two decades. Her national theatrical credits include Laura in Goblin Market (Portland Stage Company), Hodel in Fiddler on the Roof (North Carolina Theatre), Nimue in Camelot (Pittsburgh Civic Light Opera) and Amalia (originally created by Barbara Cook) in the Sheldon Harnick/Jerry Bock hit, She Loves Me (South Jersey Regional Theatre; with Joanna Papada, now V.P. Operations, Manchester Craftsman Guild, Pittsburgh, PA). In New York, Catherine appeared in Daydreams, an innovative show about Doris Day. The sold-out show was covered by the New Yorker, The Daily News and The New York Post. She created and continues to perform a one-woman show based on Native American issues and her Mohawk/Ojibwa ancestry. Catherine has been a proud member of Actor's Equity Association since the blushing age of 19. 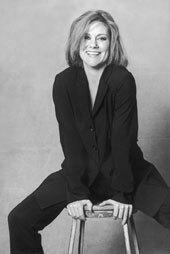 She was co-founder and Managing Director of the highly acclaimed off-Broadway Melting Pot Theatre Company which won a Drama Desk Nomination in 1997 and received critical success in the New York Times. Catherine's management skills and programming expertise have created JazzPA (formerly known as the State College Jazz Festival), begun in July 2005 (www.jazzpa.com). SCJF'06 included special guests the Russ Kassoff Trio, Bucky Pizzarelli, Ken Peplowski and the Ian Hendrickson-Smith Quintet (with Ryan Kysor and Brian Charette), in addition to featuring three successful and talented big bands resident in Central Pennsylvania. SCJF'07 featured pianist Bill Mays and the Inventions Trio (with Marvin Stamm), the Russ Kassoff Trio (with Martin Wind and Dennis Mackrel) and many local and regional musicians. In 2007, SCJF incorporated master classes into its schedule. Each year, Catherine sings a set with the Friends Big Band. Catherine was selected to present at the 2008 IAJE (International Association of Jazz Educators) in Toronto in January 2008. Her program, APA'IDI: the Intersection of Jazz and Native American Music, continues her exploration of her native ancestry even as she explores the Native American crossover to jazz demonstrated on both Moments and Rules of the Road. Working with noted pianist Bill Mays, Catherine's work demonstrates methods of incorporating traditional Native American musical elements (both general and tribal specific) into the sound of the jazz rhythm trio plus voice (both traditional and post-bop), including discussion of previous Native American/jazz crossover artists including Don Cherry, Sheila Jordan and Jim Pepper. In Toronto, Catherine was pleased to make this presentation with Bill Mays, Neil Swainson, Terry Clarke and Jani Lauzon (on cedar flute and handdrum). An audio recording of this program is available through www.onsiterecording.net (IAJE/2008 conference/Dupuis). For television, Catherine has been interviewed on "New Jersey's Talking" with Lee Leonard (New Jersey Channel 12) and on "First Music & Arts," directed and produced by Victor Linklater (APTN  Aboriginal Peoples Television Network, Canada). On radio, she has appeared on Michael Bourne's "Singers Unlimited" (WBGO-Newark, NJ) and on Jim Lowe's "Jim Lowe & Company" taped in New York for national syndication. Her records have played regularly on over 50 stations around the world, including nationally and internationally syndicated programs. Catherine received a 2001 nomination for best vocal jazz album (I Hear Music) from the independent music network, Just Plain Folks. Catherine lives and works in New York City.